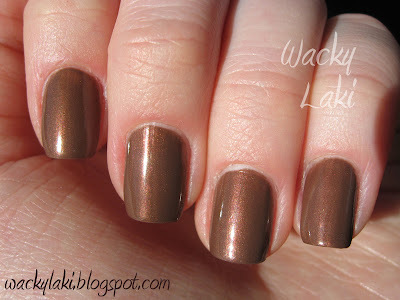 Wacky Laki: Sally Hansen Mocha - Yummy! Still, why have I not tried it on my nails before? Really wish I knew the answer to that. 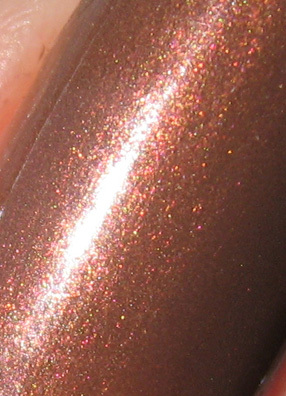 This is a really pretty medium-dark brown with a copper shimmer. It reminds me of the copper jewelry I like to make for my mom. Which reminds me that mother's day is coming up... ahhh, how did May sneak up on me already? This was three coats + a top coat. I was a little worried about it being too thin at first, but it applied great and was opaque by the third coat. I love the warm look of your copper jewelry!